Today is the day! At 8 a.m., we set off to the morning market with excitement. I could smell the aroma of the fresh seafood in the cool morning air greeting me. Be sure to wake up early as the market closes promptly at 2 p.m. (time may vary due to different days/seasons). In other words, all the delicious seafood that you've been drooling over in your dreams may be sold out if you're a late riser. 10 years ago, I went to this exact restaurant booth with my family for breakfast every morning when we stayed here, so it was quite nostalgic to set foot in here. I'm 100% sure we are going to repeat that routine just based on how much we love seafood. Just be aware that the place is quite small, so it might be a little crowded if you decide to sit down and enjoy your meal. 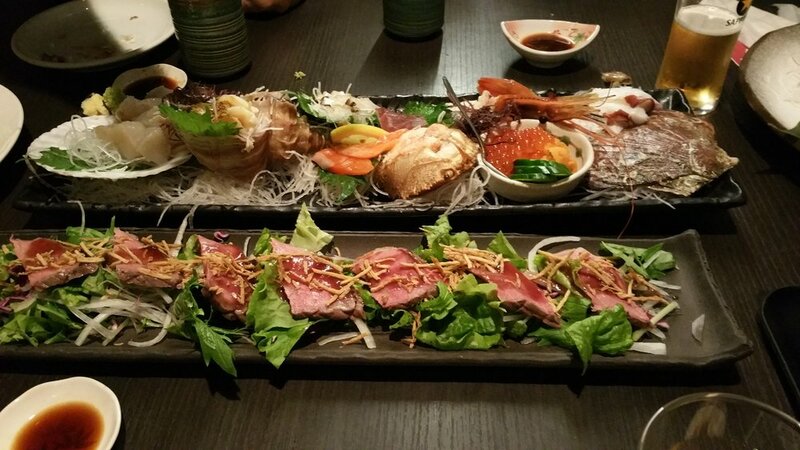 However, instead of just eating sashimi, the seafood is cooked in a barbecue style. No sauce needed. The fresh seafood gets grilled lightly before being served and you can choose to eat it with soy sauce and wasabi but I would highly recommend eating the dish without any condiment addition to appreciate the natural flavor. Our go to's were the juicy ama ebi (sweet shrimp), uni (sea urchin), abalone, and scallop. After breakfast, we went to venture around the market and stopped by the Hakodate Asaichi which had many food stalls clustered together that sold from a variety of vegetables, squid, uni, dairy products, and fruits. I wasn't able to take many pictures since it was quite crowded and I did have to help my mom carry around the many dried scallops, dried squid legs, and other goodies that could be used for making soup or just a quick savory snack. While walking around the town and enjoying the view, we came upon this cute little shop (with the green banner) that is apparently the world's second best ice cream melon pan (bread). Inside was fresh vanilla ice cream smushed between two soft yet crunchy melon bread making this quite the tasty treat. This combination reminded me of a more savory version that I had in Hong Kong called "Bo Lo You," which is pineapple bun that has melting butter inside of it. Then we came across a light beige house with blue trims surrounded by a short stone wall which happened to be the Tea Room Victorian Rose at the Old British Consulate. Behind this cozy little building was a gorgeous rose garden that was painted with many bright color roses such as light pink and peach. 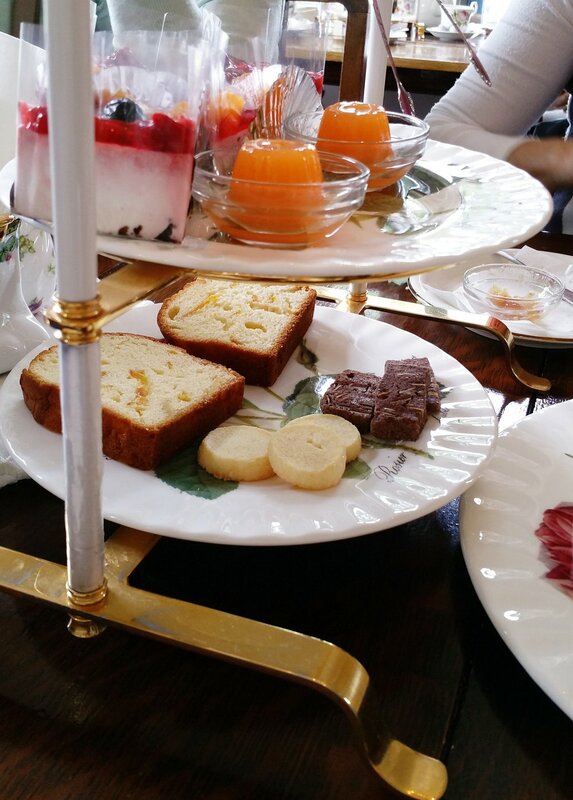 The afternoon tea was served with a traditional 2 tier serving tray decorated with sweets more than savory items (not that I minded) accompanied by a beautiful translucent rose pattern tea set. For dinner, we went to the Hakodategaya, an Izakaya restaurant, which is within walking distance of the Route Inn Grantia Hakodate Hotel. It sits on the corner of the block but immediately I felt drawn to all the tanks that contained a large variety of seafood like squid. We got seated in a traditional tatami mat dining room where you had to take off your shoes before stepping into the dining room. Since we were quite hungry, we quickly ordered many appetizers such as squid, fried squid legs, sashimi plate, fresh green salad drizzled in ranch, and many more. All the dishes you see below were all eaten in one sitting. 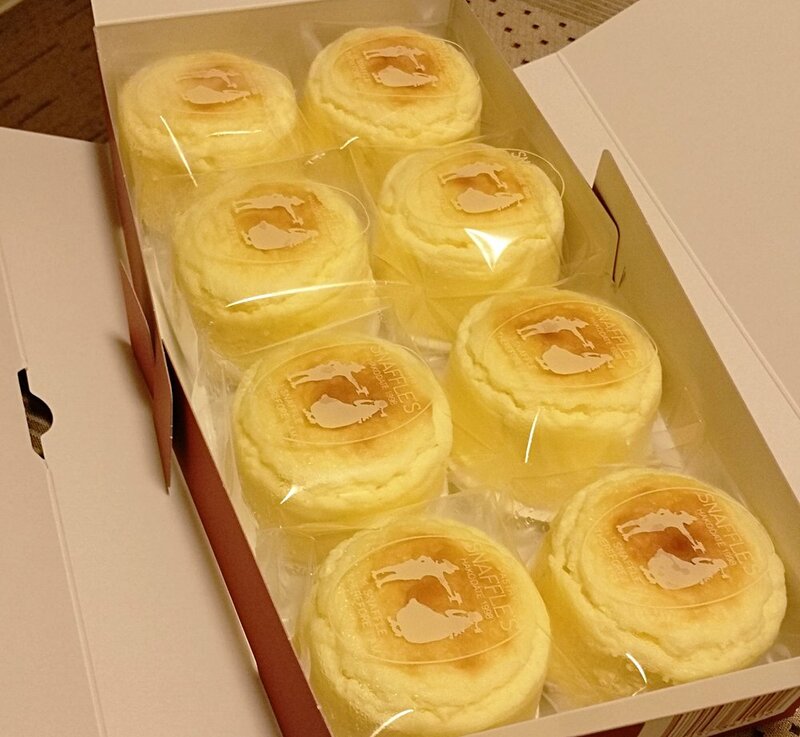 For dessert, we bought snaffles from the Hakodate JR station to end the day on a sweet note. By the way these snaffles are similar to a fluffy mini dense souffle/cheescake texture with a rich cheesy yet subtle sweet taste. After spending one night in Tokyo, I headed off to Narita Airport (NRT) to take a 1 hour flight to my next destination, Hakodate (HKD). Hakodate is one of the southern cities in Hokkaido that is quite well known for their night view on top of Mt. Hakodate and delicious seafood at their Morning Market, which is nearby the Hakodate's JR Station. Once we arrived to HKD airport, it took us around 30 minutes to ride the bus that took us to the Hakodate JR Station. Luckily, our hotel, Route Inn Grantia Hakodate Hotel was within a 5 minute walking distance. This was a very convenient location since it was also near all the buses that could go to either Hakodateyama (Mt. Hakodate) or Goryokaku (5 Star Fort). Additionally, the morning market is also within walking distance and I could not wait waking up the next day so I can have seafood as my breakfast. Yes! You heard me, seafood for breakfast. My mind cannot stay away from imagining myself devouring uni (sea urchin)! After settling all of our luggages in the hotel, we went to the bus station to travel up to Mt. Hakodate. Make sure to bring a jacket as it gets really windy and cold up there when night comes. There is a bus information kiosk that you can go to if you're unsure of which bus to hop on to get to your destination. A tip I learned from traveling to Japan is that if you say "Sumimasen (Excuse Me)," the people around are more likely to try to help compared to speaking in English. Although in the last 10 years, I have also seen the Japanese people progressively improving their English that even station managers in the city subways and JR station can now speak better English. Additionally, for those who are not familiar with the bus systems in Japan, you enter the back of the bus instead of the front. Additionally there should be a small box on the left where you need to grab these tickets for however many people are in your party. When you arrive at your destination, you go up to the front and place these tickets in a box near the bus driver while paying the bus fare. When we got off our stop, we walked a few minutes to reach the Mt. Hakodate Ropeway. A one way ticket for an adult costs about 780 yen ($7.80). I wouldn't suggest the roundtrip fare for the ropeway only because the lines get super long for the ride back (maybe around a 45 min. wait minimum depending on the crowd that night), so its better to take the bus back since it goes back all the way down to the Hakodate JR station. Inside the building, we went to go eat at the Restaurant Genova where we enjoyed watching the city of Hakodate bask in the sunset before being swept by the cool blues to signal the transition to evening. After eating dinner, we went outside to enjoy the beautiful night view. Notice the shape of Hakodate from the views, doesn't it resemble a dog bone! Want to cherish the view? You can take a 8"x6.25" photo of yourself with the view for ~2500 yen ($25.00). It will be sent to you through mail and no worries, the company follows through.